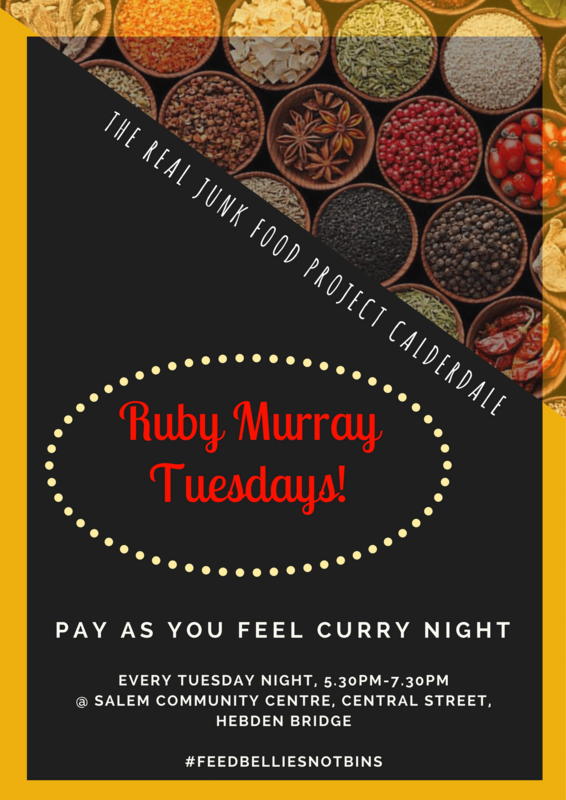 3 Valley Vegans goes to the Ruby Murray Tuesday Curry Night at The Real Junk Food Project Calderdale! The Real Junk Food Project Calderdale aims to reduce unnecessary food waste and the climatic impacts of this by salvaging food thrown away by supermarkets and other retailers and transforming it into nutritionally balanced meals. All meals are served on a ‘pay as you feel’ basis. Remember that due to the nature of the operation the food may run out before the end of the evening. So please try to come on time, but we can always find a take away if needs be – it’s about the social element as much as anything else! Spaces are very limited! If you are coming, please email tech@3valleyvegns.org.uk by Sunday evening.